I’ve been a fan of Tsushima’s lunch specials for years, but even more so now that offer DAILY SPECIALS and Happy Hour (11:30am – 12pm) Basically about 30% off! Deal/Steal/Score!!! Tuesday’s Chirashi is amazingly fresh and now that the weather is getting cooler, Wednesday Ramen is one of the best lunch deals around here. Check out the Happy Hour Discount Price!!! 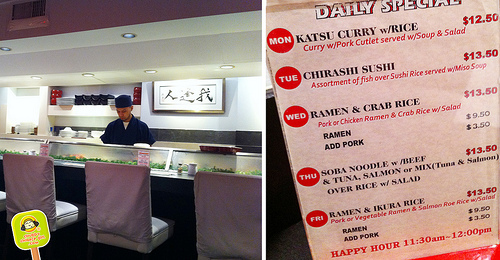 Ramen without crab rice is only $7.50!!! Salt, fish soup base. 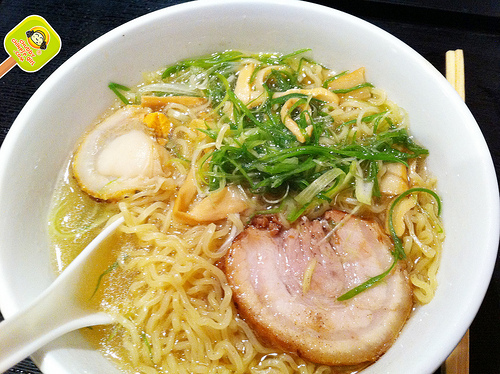 Fine strings of fresh scallion, bambo shoots, al dente noodles, bamboo shoots, fatty pork and a whole scallop. This is cheaper than the bla soba you get at the asian deli, seriously. Sooooo good. The crab rice is made with fake crab, but the beaten eggs and corn starch somehow work nicely (optional, since ramen is quite filling and satisfying). Yep, that’s where I’ll be tomorrow!